Nicholas Edward Foles (born January 20, 1989) is an American football quarterback for the Jacksonville Jaguars of the National Football League (NFL). He played college football at Arizona and was drafted by the Philadelphia Eagles in the third round of the 2012 NFL Draft. He has also played for the St. Louis Rams and Kansas City Chiefs. After stints with the Rams and the Chiefs, Foles returned to the Eagles in 2017. After Carson Wentz was injured late in the regular season, Foles led the Eagles to the franchise's third Super Bowl appearance. The Eagles defeated the New England Patriots in Super Bowl LII for their first Super Bowl title, and Foles was named the game's MVP. Foles was born and raised in Austin, Texas, the son of restaurateurs Larry and Melissa Foles. He graduated in 2007 from Westlake High School. A two-year starter for the football team, Foles threw for 5,658 yards and 56 touchdowns, breaking most school records previously held by Foles' future NFL opponent, Drew Brees. Foles originally committed to Arizona State but later decided to attend Michigan State. He ultimately transferred to the University of Arizona. Foles attended Michigan State for one year. He appeared in a game against Alabama–Birmingham, where he completed 5 of 8 passes for 57 yards. 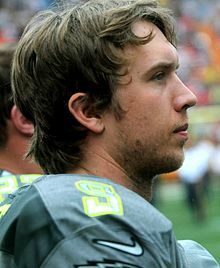 Foles transferred to Arizona and had to redshirt his 2008 freshman season. After quarterback Willie Tuitama graduated, Foles competed with expected successor Matt Scott, who got the nod after spring practice because the coaches believed he could run effectively as well as pass. Despite victories against Central Michigan and Northern Arizona, Scott struggled against Iowa and the next week was benched in favor of Foles. In Corvallis, Foles led the Wildcats to a victory against Oregon State. He started the rest of the season, completing 260 of 409 pass attempts for 2,486 yards, 19 touchdowns, and nine interceptions. As a redshirt junior in 2010, Foles was the unquestioned starter. 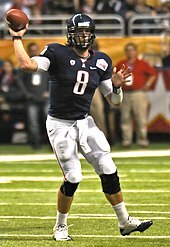 Foles led the Wildcats to a 7–1 start, including a victory against #9 Iowa on national television. Foles led the game-winning drive that ended with a touchdown pass to Bug Wright. A knee injury in the Washington State game sidelined him for two games, but Foles finished off his junior year with 3,191 yards, 20 touchdowns, and 10 interceptions. During the 2011 season, Foles completed 387 of 560 passes for 4,334 yards and 28 touchdowns. He ranked first in the Pac-12 Conference and fifth among all NCAA Division I FBS players with an average of 352.58 yards of total offense per game. He also ranked second in the Pac-12 and 20th among all FBS players in total passing yardage. Foles graduated from the University of Arizona with a degree in communication. Foles was selected by the Philadelphia Eagles in the third round with the 88th overall pick in the 2012 NFL Draft. He signed a four-year contract with the team on May 21, 2012. Despite speculation that Foles would start the Eagles' Monday Night Football game against the New Orleans Saints on November 5 (Week 9), Eagles coach Andy Reid stated that Vick would start that game. The following week against the division rival Dallas Cowboys, after Vick left the game in the second quarter with concussion symptoms, Foles made his NFL debut. Foles threw his first career touchdown pass to wide receiver Jeremy Maclin for 44 yards and finished with 22 completed passes out of 32 attempts for 219 yards, one touchdown, and one interception. With Philadelphia behind 31–23 in the last minute, Foles lost the ball as he was sacked, and Jason Hatcher of the Cowboys recovered the ball in the end zone for a touchdown. Vick was eventually ruled out of the following game against the Washington Redskins in Week 11, and Foles made his first career start. Philadelphia lost to the Redskins 31–6, and Foles was 21-for-47 in passing 204 yards with no touchdowns and two interceptions. On Monday, December 3, 2012, Eagles coach Andy Reid announced that Foles would start for the remainder of the year, regardless of when Michael Vick returned from a concussion. The following Week 14 game on December 9, Foles earned his first win as a starter in the Eagles' 23–21 win over the Tampa Bay Buccaneers. With two seconds remaining on the clock and Philadelphia down 21–16 at the Bucs' one-yard line, Foles threw a 1-yard pass to Jeremy Maclin for the game-winning touchdown as time expired. Foles completed 32-of-51 passes for 381 yards and two touchdowns – both coming in the final four minutes. He also had 27 rushing yards and a rushing touchdown. On December 23, Foles broke his hand against the Redskins, and was replaced by Vick in the season finale against the New York Giants. On December 26, Foles was placed on injured reserve. Going into training camp, new head coach Chip Kelly announced that Foles would compete with Vick and newly drafted rookie Matt Barkley for the Eagles starting quarterback job in the 2013 season. Going into preseason, it became clear that the job was a two-way battle between Foles and Vick. Foles played average during preseason while Vick excelled past him. On August 20, it was announced that Vick would start the season and Foles would be the backup. Foles saw his first action during a Week 4 loss against the Denver Broncos. He completed 3 out of 4 attempted passes for a total of 49 yards and one touchdown, with no interceptions. On October 6, Foles entered the game against the New York Giants in the second quarter, after Vick suffered a hamstring injury. Foles completed 16 of 25 passes for 197 yards and 2 touchdowns, leading the Eagles to a 36–21 win over the Giants. Later in the week, it was announced that Foles would get the start in Week 6 against the 0–4 Tampa Bay Buccaneers, after Vick was declared unable to start due to his injury. In his Week 6 start on October 13, Foles had one of the best starts of his career, completing 22 of 31 passes for 296 yards and 4 total touchdowns (3 passing, 1 rushing) in a 31–20 win over the Bucs, a performance that earned him NFC Offensive Player of the Week. On October 15, Vick announced that he needed another week of rehab before he was able to start again, making Foles the starter for the Week 7 matchup against the Dallas Cowboys for the division lead. However, against the Cowboys, Foles completed only 11 of 29 passes for a total of 80 yards, with no touchdowns. In that same game, Foles left in the 4th quarter after suffering a head injury, and was replaced by rookie Matt Barkley. Barkley did not perform well either, throwing 3 interceptions. The Eagles went on to lose 17–3 to the Cowboys thus dropping to 3–4 on the season and 1 game out of first place. The next day, Foles was diagnosed with a concussion and ruled out of any participation in the Week 8 matchup against the Giants on medical grounds. Vick left the game late in the second quarter of the Eagles 15–7 loss to the Giants in Week 8, aggravating the hamstring injury he had previously picked up in Week 5. Foles was given his third start of the season for Week 9 against the Oakland Raiders. Against the Raiders, Foles threw for seven touchdowns, tying a record held by six other quarterbacks. Foles is one of three quarterbacks to throw seven touchdowns and zero interceptions; he also amassed a perfect passer rating (158.3), having thrown more touchdown passes than incompletions. Foles was awarded his second NFC Offensive Player of the Week Award of the season for his performance against the Raiders. In Week 10 of the regular season, Foles played in his sixth game of the season (four starts) against the Green Bay Packers. Coming into the game, the Eagles had lost to the Packers on the last three occasions the teams had met (including post season). Foles completed 12 out of 18 passes for a total of 228 yards, 3 touchdowns, and no interceptions. His passer rating was extremely high for the second consecutive week, finishing at 149.3 and becoming the first quarterback in NFL history to post passer ratings above 149 in consecutive weeks. Foles carried 8 times during the game, including a 16 yard long run, finishing the game with 38 yards total and one fumble lost. The Eagles won the game 27–13 and moved to 5–5. Foles continued as the starting quarterback in Week 11 of the regular season against the Washington Redskins at home. For the sixth time this season, Foles’ passer rating eclipsed 100, as he completed 17 of his 26 attempts for 298 yards with 0 touchdowns and 0 interceptions. Foles rushed the ball on 9 occasions during the game, ending with 47 total yards and a rushing touchdown. He led the Eagles to a 24–0 lead at the end of the third quarter, before a comeback from the Redskins meant the game finished 24–16. The win moved the Eagles to an overall record of 6–5–0 and first position in the NFC East. The Eagles had not won at Lincoln Financial Field in 413 days since defeating the New York Giants on September 30, 2012; ending a streak of 10 consecutive home defeats. On November 27, Foles was named the NFC Player of the Month for his play during the month of November. The Eagles did not have a game scheduled for Week 12 of the regular season. The team returned to action on Sunday, December 1, for a home game against the Arizona Cardinals. Following their bye week, the Eagles had slipped into 2nd place in the divisional standings behind fierce rivals the Cowboys. Foles was named as the starting quarterback for the remainder of the season, a decision which Vick (who began the year as the number one quarterback) fully agreed with. For the seventh time this season, Foles's passer rating eclipsed 100, as he completed 21 of 34 attempted passes for a total of 237 yards, with 3 touchdowns and no interceptions. He also rushed for 22 yards on 9 attempts and fumbled on one occasion, although this was recovered by his teammates – and did not result in a turnover. Following a closely contested game, the Eagles held on to win 24–21 despite a fourth quarter comeback by Carson Palmer. Foles set a team record for most passes without an interception (233), breaking Michael Vick's mark of 224 set in 2010. He also moved within one touchdown pass of the record 20 straight touchdown passes set by Peyton Manning and zero interceptions to start a season before throwing an interception in a blizzard game in Philadelphia against the Detroit Lions in which the Eagles won 34–20. The win took the Eagles to an overall record of 8–5 and surpassed Dallas for the number one spot in the NFC East. A week later in Minnesota, the team's five game winning streak was snapped with a loss to Minnesota. However, Foles again had another impressive game with yet another passer rating over 100 and three more touchdowns and only his second interception of the season. The following week, the Eagles defeated the Chicago Bears 54–11, which saw another passer rating over 100 and a completion of 84.0% of his passes, a career-high. Foles helped lead the Eagles to their first NFC East division title in three years by beating the Cowboys in the regular season finale. Foles had his ninth game with a passer rating over 100. 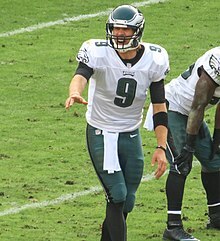 Foles finished the 2013 regular season with 27 touchdown passes and only 2 interceptions, surpassing Tom Brady's 2010 season posting of 36/4 for the best TD-INT ratio in NFL history, and a season leading 119.0 passer rating and third in NFL history trailing only to Aaron Rodgers' 122.5 rating in 2011 and Peyton Manning's 121.1 rating in 2004. Foles led the Eagles to a playoff berth, the first since 2010. Hosting the New Orleans Saints in the playoffs at Lincoln Financial Field, the Eagles lost on a last-minute field goal as the game ended at 26–24. Foles threw for 195 yards, two touchdowns, and no interceptions, for a passer rating of 105.0, in his postseason debut. Foles was awarded the "NFL Greatness on the Road" award for his seven touchdown, perfect game performance against the Oakland Raiders during a road game in 2013. Foles was also assigned to the 2014 Pro Bowl as an alternate and was drafted by Team Sanders. Despite losing the game, Foles went 7 for 10 for 89 yards and a go ahead touchdown. Foles won the Pro Bowl Offensive MVP award, which included a new GMC truck. Going into 2014, Chip Kelly had released Foles' top receiver, DeSean Jackson, but Jeremy Maclin, who had good chemistry with Foles in 2012, returned from an ACL tear and had a career season, gaining 702 yards and six touchdowns with Foles as quarterback, finishing with 1,318 yards and ten scores. He was also aided by rookie receiver Jordan Matthews, second year tight end Zach Ertz, and veteran running back Darren Sproles. Foles and the Eagles kicked off their 2014 season with a Week 1 home matchup against the Jacksonville Jaguars. Foles started the game poorly, losing 2 fumbles and throwing an interception in the first half. Foles only lost 2 fumbles and threw 2 interceptions the entire 2013 season. The Eagles defense also performed poorly, as they trailed 17–0 after the first half. However, the Eagles roared back in the second half, scoring 34 unanswered points to defeat the Jags 34–17. Overall, Foles completed 24 of 45 passes for 332 yards and 2 touchdowns, along with the 3 turnovers. Foles led the Eagles to a 30–27 win over the Colts after trailing by as much as 20–6 early in the third. Foles went 21–37, passing for 331 yards, 1 touchdown, and 1 interception during the game. Foles played his best game of the young season in 37–34 win over the division rival Washington Redskins. Foles fought off the slow starts of games past, a strong Washington defensive front seven, and a brutal blindside hit from Washington defensive lineman Chris Baker which resulted in a major brawl between both teams and causing Eagles left tackle Jason Peters, the strongest player in their line, and Baker to be ejected from the game. Foles finished the game completing 66 percent of his passes, going for 325 yards and three touchdowns. In Week 8, Foles set a franchise record for most completions in a game with 36 and threw a career-high 62 times in a close loss to the Arizona Cardinals, finishing with 411 passing yards and 2 touchdowns. The following week in a game against the Houston Texans, Foles left the game during the first half with a broken collarbone, which led to Foles being put on injured reserve, ending his 2014 season. Mark Sanchez finished out the season as the Eagles starting quarterback. After a league-best 27–2 TD-INT ratio in 2013, Foles finished the season with 2,163 yards in 8 games, and a 13–10 TD-INT ratio. He also fumbled 4 times, only recovering it once. Overall, all of his stats were narrowly beaten by Sanchez, including turnovers (14–11 TD–INT ratio). He led the team to a 6–2 record as starter, first place in the NFC East and second place in the NFC. On March 10, 2015, the Eagles traded Foles, a 2015 fourth-round pick, and a 2016 second-round pick to the St. Louis Rams in exchange for Sam Bradford and a 2015 fifth-round pick. Foles signed a two-year, $24.5 million extension with the Rams on August 7, 2015. Foles's first game with the team came against the division rival Seattle Seahawks, who had the league's No. 1 defense in 2013 and 2014. Foles went 18 for 27 and passed for 297 yards in the game, and his lone passing touchdown came with 53 seconds left, bringing the game into overtime. He also ran for 11 yards and 1 touchdown, which put the Rams in the lead in the middle of the second quarter. In overtime, Foles threw a 22-yard pass to wide receiver Stedman Bailey, which set up the Rams' game-winning field goal over the defending NFC Champions. Following the dramatic win, Foles struggled against his former divisional rival, the Washington Redskins. Although he didn't turn the ball over, he only completed 17 passes out of 32 for 150 yards and the Rams lone touchdown as they lost 24–10. Foles' accuracy improved the following week, going 19–28 for 197 yards, but he threw no touchdowns and his first interception as a Ram against the Pittsburgh Steelers, and the Rams dropped to 1–2. Following the two losses, Foles bounced back, going 16–24 for 3 touchdowns and no turnovers to hand the 3–0 Arizona Cardinals their first loss of the season. After that game, Foles' problems with turnovers from 2014 started to show, as he completed 11 passes out of 30 for 141 yards, 1 touchdown, and a career-high 4 interceptions against the Green Bay Packers. On November 16 Foles was benched in favor of Case Keenum. He won his starting job back two weeks later after Keenum was out with a concussion, but his struggles worsened. In a loss against Cincinnati Bengals, he went 30–46 for 228 yards (his second highest total of the year) and 3 interceptions, and followed it up by going 15/35 for 146 yards and 1 interception in a 27–3 loss to the Arizona Cardinals. Foles was again benched after Keenum returned from his concussion. 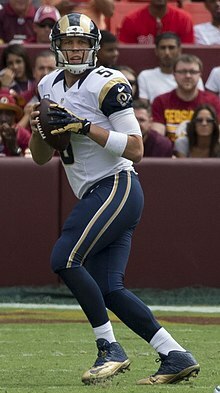 Upset that the now-Los Angeles Rams drafted quarterback Jared Goff with the first overall pick of the 2016 NFL draft, Foles requested and was granted a release on July 27, 2016. Foles signed with the Kansas City Chiefs on August 3, 2016. It was a one-year deal worth $1.75 million and included a second-year option for 2017, worth between $6.75 million and $16 million depending on his performance during the Chiefs' 2016 season. In Week 8 at Indianapolis Colts after Alex Smith left the game with a concussion, Foles took over for the remainder of the game, and finished 16/22 completions with 223 yards and two touchdowns. The Chiefs announced that Foles would start in Week 9 against the Jacksonville Jaguars as Smith was still recovering from injury. Foles won the game over the Jaguars, 19–14, and finished 20–33 with 187 yards and a touchdown. The next day, Smith was announced to start Week 10. On March 9, 2017, the Chiefs declined a second-year option on his contract, making him a free agent. On March 13, 2017, Foles signed a two-year contract to return to the Philadelphia Eagles to back up 2016 first-round pick Carson Wentz. During Week 14 against the Los Angeles Rams, Foles came in relief of Wentz, who left the game with a torn ACL. Foles completed 6 of 10 passes for 42 yards as the Eagles won 43–35, clinching their first division title since 2013. On December 11, 2017, head coach Doug Pederson announced that Foles would be the starter after Wentz was ruled out for the season. Starting his first game of the season in Week 15, Foles threw for 237 yards and 4 touchdowns in a 34–29 victory over the New York Giants. The next week, he helped the Eagles defeat the Oakland Raiders in Week 16 by a score of 19–10. He was 19-of-38 for 163 passing yards, one touchdown, and one interception. He had a limited role to avoid injury in the regular season finale, a 6–0 loss to the Dallas Cowboys. On January 13, 2018, the Eagles defeated the Atlanta Falcons 15–10, in the NFC Divisional playoff game, with Foles completing 23 of 30 passes for 246 yards. This was the Eagles' first playoff victory in nine seasons. On January 21, 2018, the Eagles defeated the Minnesota Vikings, 38–7, in the NFC Championship Game, with Foles going 26 of 33 for 352 yards and 3 touchdowns. The Vikings were 3-point favorites with the league's top-ranked defense entering the game. In Super Bowl LII, Foles caught a touchdown pass from tight end Trey Burton, becoming the first player to both throw and catch a touchdown pass in a Super Bowl, while also being the third quarterback to catch a pass in a Super Bowl, after John Elway in Super Bowl XXII and Jim Kelly in Super Bowl XXVI. The Eagles defeated the New England Patriots 41–33 to win their first Super Bowl. Foles completed 28 of 43 passes for 373 yards, 3 passing touchdowns and 1 interception, and was named the Most Valuable Player of the game. On April 20, 2018, Foles and the Eagles agreed on a new revised contract that would contain a $2 million bonus, millions in incentives if he were to become the starting quarterback, and a 2019 mutual option. On September 3, 2018, Foles was named starter for the season opener against the Atlanta Falcons, as Wentz was not yet medically cleared for contact. Foles helped lead the Eagles to a 1–1 record through two games, with 1 touchdown pass, 1 interception, and a 78.9 passer rating, before Wentz was announced as the starter for Week 3. On December 12, 2018, it was announced that Carson Wentz would probably sit out due to a back injury in the Week 15 game against the Los Angeles Rams, thus giving Foles his third start of the season. Foles ended up starting as expected and threw for 277 yards with 24 completions on 31 pass attempts and one interception in a 30–23 win. In Week 16, Foles started against the Houston Texans where he threw for 471 yards with 35 completions on 49 pass attempts and four touchdowns with one interception in a 32–30 victory, earning him NFC Offensive Player of the Week. The 471 yards broke Donovan McNabb's record for most passing yards by an Eagles quarterback in a single game. On December 30, in a Week 17 game with the Washington Redskins, Foles tied the NFL record for consecutive pass completions with 25 in a row, while the Eagles clinched a playoff berth. In the Wild Card playoff game against the Chicago Bears at Soldier Field, Foles led the Eagles on a game-winning touchdown drive that culminated with a pass to Golden Tate with 56 seconds left in the game as the Eagles won 16–15 and advanced to play the top-seeded New Orleans Saints in the Divisional Round. Against the Saints, Foles threw an interception to Marshon Lattimore on a potential game-winning drive in the fourth quarter as the Eagles lost, 20–14, after Foles scored two touchdowns in the first quarter. On January 19, 2019, the Eagles announced they will pay Foles the $1 million bonus for playing 33 percent of the Eagles' snaps and the team made the playoffs, even though Foles missed the mark by just four plays (32.69 percent). On March 13, 2019, Foles signed a four-year contract worth $88 million with the Jacksonville Jaguars. Foles is a Christian. He is currently an online graduate student at Liberty University, earning his master's degree in divinity. He has stated that he plans to become a pastor after his football career, saying, "I want to be a pastor [...] I took a leap of faith last year and signed up to take classes at seminary. I wanted to continue to learn and challenge my faith. It's a challenge because you are writing papers that are biblically correct." He married Tori Moore, who is the younger sister of former NFL tight end Evan Moore, in 2014. Moore and Foles were briefly teammates with the Eagles in 2012. The couple had a daughter together in 2017. Foles lives in a south New Jersey home in Haddonfield. ^ Bowen, Les (November 15, 2012). "Eagles rookie Nick Foles' father says his son is ready for start". Philadelphia Daily News. Retrieved December 12, 2013. ^ Jones, Thomas. "Nick Foles helps Westlake make history with upcoming Super Bowl appearance". Statesmen. Retrieved January 23, 2018. ^ "Foles finally meets Brees on the field". ESPN. January 2, 2014. ^ "Drew Brees vs. Nick Foles: A duel spawned by Westlake High". nfl.com. January 2, 2014. ^ a b c "Nick Foles Profile". Archived from the original on November 2, 2012. Retrieved October 24, 2012. ^ Wulf, Bo. "Reid Assesses QB Picture". PhiladelphiaEagles.com. Retrieved October 24, 2012. ^ a b "QB Nick Foles". PhiladelphiaEagles.com. Retrieved October 24, 2012. ^ "UAB at Michigan State Box Score, September 1, 2007". College Football at Sports-Reference.com. Retrieved January 23, 2018. ^ "Stoops endorses Nichol, Foles won't be back at MSU". MLive.com. Retrieved April 4, 2018. ^ "Arizona Wildcats 2009 College Football Preview". National Champs. Retrieved April 4, 2018. ^ "Arizona at Oregon State Box Score, September 26, 2009". College Football at Sports-Reference.com. Retrieved January 23, 2018. ^ "Nick Foles". Retrieved March 23, 2017. ^ "Iowa at Arizona Box Score, September 18, 2010". College Football at Sports-Reference.com. Retrieved January 23, 2018. ^ "Nick Foles 2010 Game Log". College Football at Sports-Reference.com. Retrieved January 23, 2018. ^ "Nick Foles 2011 Game Log". College Football at Sports-Reference.com. Retrieved January 23, 2018. ^ "Statistics – Individual (Total Offense)". ncaa.com. Retrieved November 27, 2011. ^ "NCAA Division I-A Player Passing Statistics – 2011 (Passing Yards Leaders – All Players)". ESPN.com. Retrieved November 27, 2011. ^ "Ryan Lindley". sports-reference.com. Sports Reference LLC. Retrieved September 2, 2016. ^ "2012 NFL Draft Listing". Pro-Football-Reference.com. Retrieved January 23, 2018. ^ Warren, Micah. "Eskin says Eagles likely switching to Nick Foles". Off the Record (OTR). Retrieved October 29, 2012. ^ Sessler, Nick. (October 29, 2012) Andy Reid not ready to bench Michael Vick in Philly NFL.com. Retrieved October 31, 2012. ^ "Cowboys capitalize on turnovers as Eagles lose Michael Vick". ESPN. Associated Press. Retrieved November 11, 2012. ^ "Eagles QB Vick out; Foles to start at Washington". Yahoo! Sports. November 16, 2012. Retrieved November 16, 2012. ^ "Philadelphia Eagles vs Washington Redskins boxscore". ESPN.com. November 18, 2012. Retrieved November 19, 2012. ^ "Nick Foles to start for rest of '12". ESPN.com. December 3, 2012. Retrieved December 3, 2012. ^ "Nick Foles' TD pass with no time left snaps Eagles' skid". ESPN.com. Associated Press. Retrieved December 9, 2012. ^ "Eagles: Foles breaks hand, Vick likely to start". Yahoo! Sports. Associated Press. December 24, 2012. Retrieved December 24, 2012. ^ "Eagles place Foles on IR, Sign DT Dixon". Yahoo! Sports. Associated Press. December 26, 2012. Retrieved December 26, 2012. ^ "Nick Foles fires shot in QB battle: 'I'm here to play'". USA TODAY. Retrieved April 4, 2018. ^ "Michael Vick, Nick Foles are 'even' at start of QB competition". USA TODAY. Retrieved April 4, 2018. ^ "Michael Vick named Philadelphia Eagles' starting quarterback over Nick Foles". SI.com. Retrieved April 4, 2018. ^ "Peyton Manning tosses four TD passes in Denver Broncos' rout of Eagles". NFL.com. The Associated Press. September 30, 2013. Retrieved November 11, 2013. ^ "Philadelphia Eagles at New York Giants – October 6th, 2013". Pro-Football-Reference.com. Retrieved January 23, 2018. ^ "Philadelphia Eagles at Tampa Bay Buccaneers – October 13th, 2013". Pro-Football-Reference.com. Retrieved January 23, 2018. ^ "Dallas Cowboys at Philadelphia Eagles – October 20th, 2013". Pro-Football-Reference.com. Retrieved January 23, 2018. ^ "Dallas Cowboys at Philadelphia Eagles – October 20th, 2013". Pro-Football-Reference.com. Retrieved April 4, 2018. ^ Wesseling, Chris (November 3, 2013). "Nick Foles ties NFL record with 7 TD passes; Eagles win". NFL.com. NFL Enterprises. Retrieved November 4, 2013. ^ "2013 NFL Week 9 Leaders & Scores". Pro-Football-Reference.com. Retrieved April 4, 2018. ^ Patrick Gilligan (November 10, 2013). "Philadelphia Eagles Vs. Green Bay Packers Results". Patrick Gilligan. The Football Database. Retrieved November 11, 2013. ^ "Philadelphia Eagles at Green Bay Packers – November 10th, 2013". Pro-Football-Reference.com. Retrieved January 23, 2018. ^ "Washington Redskins at Philadelphia Eagles – November 17th, 2013". Pro-Football-Reference.com. Retrieved January 23, 2018. ^ Smith, Alex. "Foles Proud To Help Deliver Home Win". Philadelphia Eagles Official Website. Retrieved November 17, 2013. ^ "Philadelphia Eagles top Washington Redskins, snap 10-game home losing skid". NFL.com. The Associated Press. Retrieved November 18, 2013. ^ Patra, Kevin. "Michael Vick: Nick Foles should be Eagles' starting QB". NFL.com. Retrieved December 2, 2013. ^ "Arizona Cardinals at Philadelphia Eagles – December 1st, 2013". Pro-Football-Reference.com. Retrieved January 23, 2018. ^ "Foles leads Eagles to narrow defeat of Cardinals". NFL.com. The Associated Press. Retrieved December 2, 2013. ^ "Philadelphia Eagles at Minnesota Vikings – December 15th, 2013". Pro-Football-Reference.com. Retrieved January 23, 2018. ^ "Chicago Bears at Philadelphia Eagles – December 22nd, 2013". Pro-Football-Reference.com. Retrieved January 23, 2018. ^ "Philadelphia Eagles at Dallas Cowboys – December 29th, 2013". Pro-Football-Reference.com. Retrieved January 23, 2018. ^ "For Foles, Dallas Now Behind Him – Philadelphia Magazine". December 30, 2013. Retrieved March 23, 2017. ^ "Wild Card – New Orleans Saints at Philadelphia Eagles – January 4th, 2014". Pro-Football-Reference.com. Retrieved January 23, 2018. ^ a b "GMC Heads to the 2014 Pro Bowl and Super Bowl XLVIII". Retrieved February 1, 2014. ^ a b "Jaguars vs. Eagles – Game Summary – September 7, 2014 – ESPN". Retrieved March 23, 2017. ^ "Washington Redskins at Philadelphia Eagles – September 21st, 2014". Pro-Football-Reference.com. Retrieved January 23, 2018. ^ Gowton, Brandon Lee (September 22, 2014). "Eagles-Redskins: NFL Rulebook explains why Chris Baker's hit on Nick Foles was illegal". Yahoo. Retrieved September 22, 2014. ^ Florio, Mike (September 21, 2014). "No suspension for Baker or Peters, but a "ton of fines" coming". ProFootballTalk. Retrieved September 21, 2014. ^ "Philadelphia Eagles at Arizona Cardinals – October 26th, 2014". Pro-Football-Reference.com. Retrieved January 23, 2018. ^ Paige, Marissa (November 4, 2014). "Nick Foles reportedly won't need surgery, but some doubt his future with the Eagles anyway". Retrieved November 5, 2014. ^ "Nick Foles 2014 Game Log". Pro-Football-Reference.com. Retrieved January 23, 2018. ^ Simmons, Myles (March 10, 2015). "Rams Acquire Nick Foles". StLouisRams.com. ^ Florio, Mike. "Eagles give up 2016 second-rounder for Bradford, too". Pro Football Talk. Retrieved March 11, 2015. ^ Wesseling, Chris (August 7, 2015). "Nick Foles, St. Louis Rams strike two-year extension". NFL.com. Retrieved August 7, 2015. ^ Wagoner, Nick (September 13, 2015). "Led by Nick Foles, resilient Rams fight their way to victory". ESPN.go.com. Retrieved September 13, 2015. ^ "St. Louis Rams at Washington Redskins – September 20th, 2015". Pro-Football-Reference.com. Retrieved January 23, 2018. ^ "Pittsburgh Steelers at St. Louis Rams – September 27th, 2015". Pro-Football-Reference.com. Retrieved January 23, 2018. ^ "St. Louis Rams at Arizona Cardinals – October 4th, 2015". Pro-Football-Reference.com. Retrieved January 23, 2018. ^ "St. Louis Rams at Green Bay Packers – October 11th, 2015". Pro-Football-Reference.com. Retrieved January 23, 2018. ^ "St. Louis Rams at Cincinnati Bengals – November 29th, 2015". Pro-Football-Reference.com. Retrieved January 23, 2018. ^ "Arizona Cardinals at St. Louis Rams – December 6th, 2015". Pro-Football-Reference.com. Retrieved January 23, 2018. ^ Patra, Kevin (July 27, 2016). "Rams cut quarterback Nick Foles after release request". NFL.com. Retrieved July 27, 2016. ^ Wesseling, Chris (August 4, 2016). "Chiefs agree to terms with former Rams QB Nick Foles". NFL.com. Retrieved August 4, 2016. ^ "Watch Kansas City Chiefs vs. Indianapolis Colts [10/30/2016] – NFL.com". Retrieved March 23, 2017. ^ "Chiefs to start QB Foles; RB Charles has surgery". Retrieved March 23, 2017. ^ "Watch Jacksonville Jaguars vs. Kansas City Chiefs [11/06/2016] – NFL.com". Retrieved March 23, 2017. ^ "Chiefs say Smith will start, eye Houston's return". Retrieved March 23, 2017. ^ Gantt, Darin (March 9, 2017). "Chiefs officially decline Nick Foles option, making him a free agent". ProFootballTalk.NBCSports.com. ^ McPherson, Chris (March 13, 2017). "QB Nick Foles Returns To Eagles". PhiladelphiaEagles.com. ^ Orr, Conor (March 13, 2017). "Nick Foles returning to Eagles on two-year deal". NFL.com. ^ "Wentz has torn ACL, will miss rest of season". Retrieved December 13, 2017. ^ "Philadelphia Eagles at New York Giants – December 17th, 2017". Pro-Football-Reference. Retrieved January 13, 2018. ^ "Eagles clinch top seed, but Foles has tough time vs Raiders". USA TODAY. Retrieved October 2, 2018. ^ "Cowboys beat playoff-bound Eagles 6–0". USA TODAY. Retrieved October 2, 2018. ^ "Divisional Round – Atlanta Falcons at Philadelphia Eagles – January 13th, 2018". Pro-Football-Reference. Retrieved January 15, 2018. ^ Silver, Michael (January 22, 2018). "Eagles' Doug Pederson sets tone as Nick Foles rounds into form". NFL.com. Retrieved April 20, 2018. ^ Goessling, Ben (January 22, 2018). "Vikings suffer shocking blowout loss to Eagles, 38–7, in NFC Championship Game". Star Tribune. Retrieved April 20, 2018. ^ Graziano, Dan (January 22, 2018). "From backup to Eagles' lead dog: Nick Foles is win away from Super Bowl glory". ESPN.com. Retrieved April 20, 2018. ^ "NFC Championship – Minnesota Vikings at Philadelphia Eagles – January 21st, 2018". Pro-Football-Reference.com. Retrieved January 23, 2018. ^ Gorman, Kevin. "For Super Bowl QBs as receivers, Foles the hero and Brady the goat". Trib Live. Retrieved April 4, 2018. ^ Benne, Jon (February 4, 2018). "Nick Foles completes miracle playoff run with Super Bowl MVP award". SB Nation. ^ "Philadelphia Eagles win Super Bowl LII". NFL. Retrieved February 4, 2018. ^ Bergman, Jeremy (April 20, 2018). "Nick Foles, Eagles agree to revised deal with '19 option". NFL.com. Retrieved April 20, 2018. ^ Spadaro, Dave (September 3, 2018). "It's Official: Nick Foles Starts Thursday Vs. Falcons". philadelphiaeagles.com. Retrieved September 3, 2018. ^ Patra, Kevin (September 17, 2018). "Carson Wentz cleared to return, will start Sunday". NFL.com. Retrieved September 22, 2018. ^ "Nick Foles 2018 Game Log". Pro-Football-Reference.com. Retrieved September 22, 2018. ^ Patra, Kevin. "Carson Wentz (back) not expected to play vs. Rams". NFL.com. Retrieved January 23, 2019. ^ McManus, Tim (December 17, 2018). "Nick Foles works magic again, leads Eagles to upset of Rams". ESPN. Retrieved December 18, 2018. ^ "Nick Foles 2018 Game Log". Pro-Football-Reference.com. Retrieved December 30, 2018. ^ Zangaro, Dave (December 30, 2018). "Eagles clinch playoff spot, with some help from their opponent next weekend". NBC Sports Philadelphia. Retrieved January 23, 2019. ^ Wilner, Barry (January 7, 2019). "Foles leads Eagles to 16–15 upset of Bears". AP News. Retrieved January 8, 2019. ^ Maske, Mark. "Eagles-Saints live updates: New Orleans escapes with 20–14 victory, will play Rams for NFC title". Washington Post. Retrieved January 14, 2019. ^ Shook, Nick (February 5, 2019). "Nick Foles informs Eagles he'll void $20M option". NFL.com. ^ Oehser, John (March 13, 2019). "Official: Foles, Jaguars agree to terms". Jaguars.com. ^ Bergman, Jeremy (March 13, 2019). "Nick Foles signs four-year deal with Jacksonville Jaguars". NFL.com. ^ a b "Nick Foles Stats". Pro-Football-Reference. Sports-Reference. Retrieved January 1, 2018. ^ Garcia IV, Bob (February 5, 2018). "Nick Foles Now Owns One Of The NFL's Most Prestigious Playoff QB Records". ClutchPoints. Retrieved March 27, 2019. ^ "NFL Player Passing Statistics – 2013". ESPN.com. ^ Kerr, Jeff. "More record stats behind Nick Foles' historic postseason". Philadelphia Eagles. Retrieved March 27, 2019. ^ "Press Conference: Nick Foles". Philadelphia Eagles. November 7, 2013. ^ FOX. "Nick Foles plans to become a pastor after football career". WTXF. Retrieved February 3, 2018. ^ Shorr-Parks, Eliot. "Eagles QB Nick Foles marries longtime girlfriend, Tori Moore". NJ.com. Retrieved May 17, 2017. ^ Juneau, Jen. "Nick Foles' 7-Month-Old Daughter Stole the Show at Super Bowl". People Magazine. People Magazine. Retrieved February 5, 2018. ^ Gunther, Erik. "NFL Cribs: Where Do the Highest-Flying Philadelphia Eagles Choose to Nest?". Retrieved May 22, 2018. Wikimedia Commons has media related to Nick Foles.